HOUSTON (AP) James Harden said the Houston Rockets ”put on a show” in the second half against the New York Knicks on Saturday night, but the show he was talking about surprisingly had nothing to do with Houston’s potent offense. 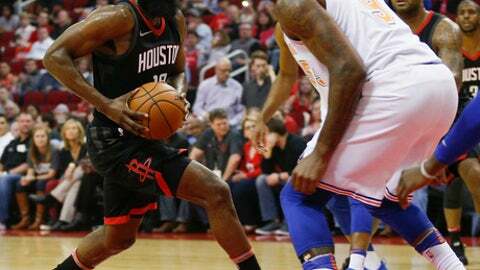 In Houston’s 117-102 victory over the Knicks, Harden highlighted the Rockets’ third-quarter defense where the Knicks scored just 13 points, a season-low for points in a quarter both for the Knicks as well as Rockets opponents. Along with Harden’s 37 points and 10 assists, it was that defensive tenacity that helped the Rockets rally back from a sizeable early deficit. The Rockets erased New York’s early 22-point lead by making 18 3-pointers and getting 44 points from their bench, led by 17 from Ryan Anderson. The Knicks rode hot shooting to build a 29-7 lead midway through the first quarter. The shots eventually stopped falling, turnovers mounted, and the Rockets shot their way back into the game, mostly from long range. The Knicks led 39-29 at the end of the first quarter, and Houston finally tied the game at 51 on a free throw by Chris Paul late in the second quarter. The Knicks led 61-58 at halftime. Houston pulled away in the third quarter, outscoring New York 37-13, capped off by a 3-pointer from Anderson at the buzzer to put the Rockets up 95-74 entering the fourth. New York starters Kristaps Porzingis and Enes Kanter sat out the game because of back ailments. Porzingis (lower back tightness) played 36 minutes Friday night in Atlanta, scoring 28 points. He entered Saturday fourth in the NBA at 27.3 points per game. In place of Porzingis and Kanter, Knicks reserves Michael Beasley and Kyle O’Quinn started. Beasley had a season-high 30 points, while O’Quinn had his first double-double of the season with 20 points and 15 rebounds. Houston has defeated New York in 24 of the past 26 meetings. The Rockets have won four straight and are 10-1 in November with home games against Brooklyn and Indiana remaining in the month. The Knicks lost consecutive games for the first time since starting the season 0-3. The Rockets have hit at least 18 3-pointers in four straight games, twice as long as any other streak of 18 3s in NBA history. Houston is 12-0 when hitting 15 or more 3s this season. Harden made 5 of 13 3-point attempts, while Anderson and Trevor Ariza both added four 3s. Paul had a season-high 13 assists. Knicks: Kanter missed his second straight game with back spasms that first occurred Friday. He’s averaging 13.6 points and 10.2 rebounds. … The Knicks also were missing center Joakim Noah, who isn’t traveling with the team because of an illness. Rockets: Eric Gordon (calf) and Anderson (illness) returned after missing Houston’s win over Denver on Wednesday. Gordon had eight points in 24 minutes. … Clint Capela had 12 points, 14 rebounds and three blocks. At 15-4, the Rockets are off to their third-best start to a season in franchise history. Houston is off to its best 19-game start to a season since opening the 1996-97 season 17-2. That team would go on to finish 57-25 and lose to the Utah Jazz in the Western Conference Finals. ”That was a hard man to cover,” Hornacek told reporters after being greeted postgame by Rockets Hall of Fame center Hakeem Olajuwon. A small pocket of the Toyota Center crowd went wild when Houston-native rookie guard Damyean Dotson scored midway through the fourth quarter. Dotson played at Yates High School and the University of Houston and scored two points in 10 minutes in his first trip home as a professional. As part of Houston’s new ”First Shot” promotion featuring a local celebrity shooting a pregame free throw for charity, actor Rico Rodriguez, who is best known for playing Manny on the sitcom Modern Family, missed his shot attempt. Knicks: Host Portland on Monday night. Rockets: Host Brooklyn on Monday night.